From Japan comes this Scotch Malt Whisky Society whisky called ’Fascinating complexity and finesse’. 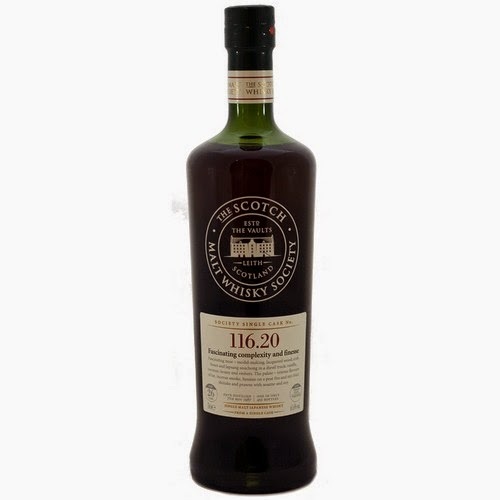 It is from a Virgin Oak Puncheon cask and resulted in 452 bottles. It smells like dark rum, sweet vanilla and some rubber. It tastes like strange peated dark rum. Lots of wood in the taste as well and again you can sense the rubber. I feel like this whisky can’t decide whether to be a whisky or an old rum. The finish is still filled with wood and some of the vanilla sweetness from the smell. For a 26 year old Japanese whisky to 300 £ a bottle I really miss some complexity. It’s not that I don’t like it, but I would never consider buying this! I will rate this 83/100 (21/21/21/20).